Tongue in Cheek! : Doctor Hair! I did nothing when I could. Let me cut them without an error! The shampoos did nothing for whom you paid? And they were a complete waste! No more! The scissor is my savior at last! How to make her try the TRESemme thing! Just because they don't hurt and they easily bend? And also because they disappear and I look great! So this is not fair! Your hair doesn't deserve to get cut! Nor like the teeth or tongue! You cut it without a feeling of treason? For a few split ends? Who can forever remove your frown! Who is that? asked she with a raised eyebrow and a haha! 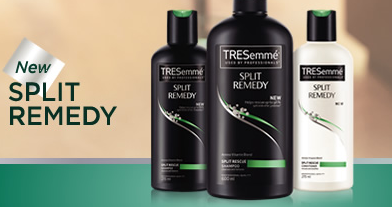 I held up the new pack of TRESemme Split Remedy Shampoo Conditioner..Ta da! So that was a week ago! And today, for the scissor it is a firm no! Split ends are no more a pain. We now call you Doctor Hair! And it's like her hair is having an affair! And she looks so pretty! They would make a beautiful pair!